contact us for below 500 qty price. price do not include logo printing unless stated. Hurry !!! 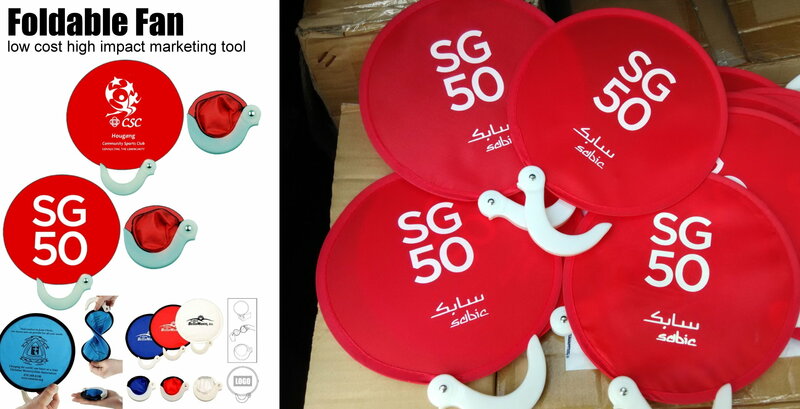 limited period $2 gifts to celebrate Merdeka Generation, MOQ 500. price include logo printing in our china factory need 4-5 weeks. no more losing your valuables or personal items. 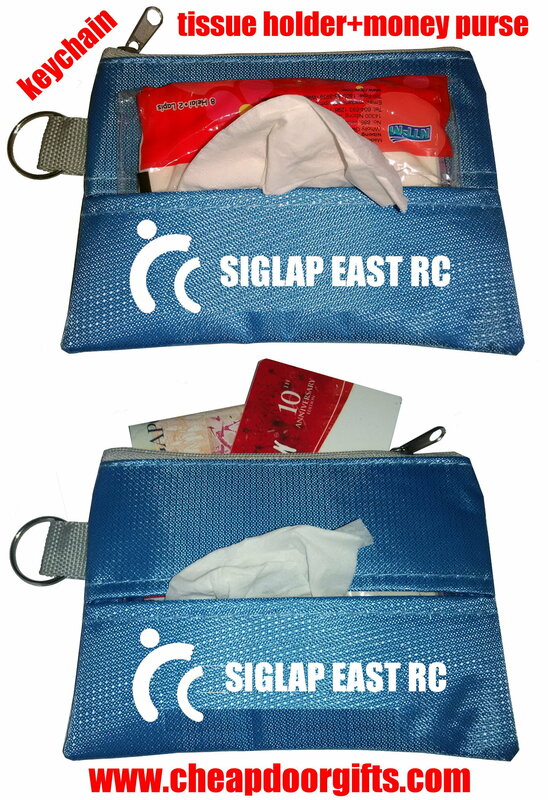 Great for senior citizens, travel, outdoor or keep all items in one place whenever you need it. moq 500 contact us for small qty price. Can customise to your sizes. Many happy customers. 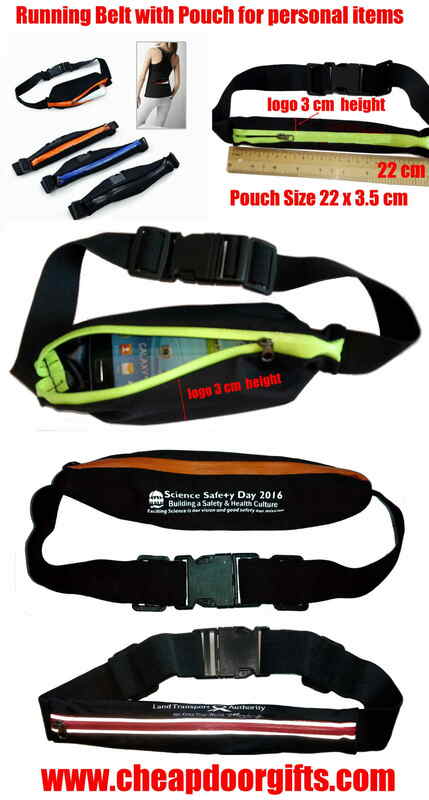 Good waterproof materials Size: 32 x 14.5 x 13 cm. 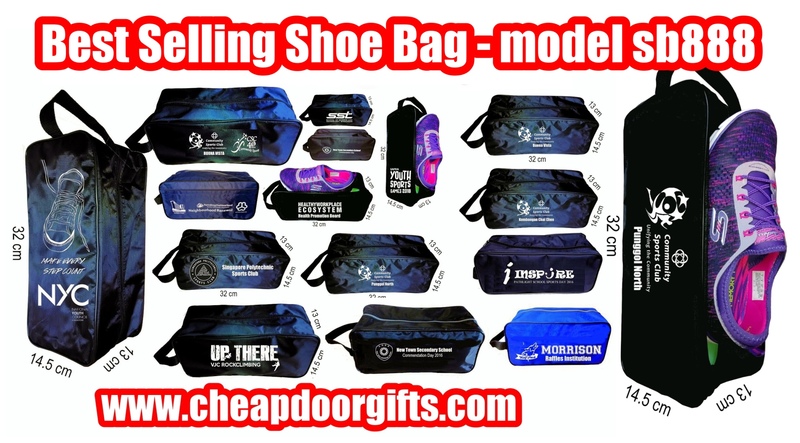 everyone love this shoe bag. we have immediate stocks and can print logo+text (additional costs). 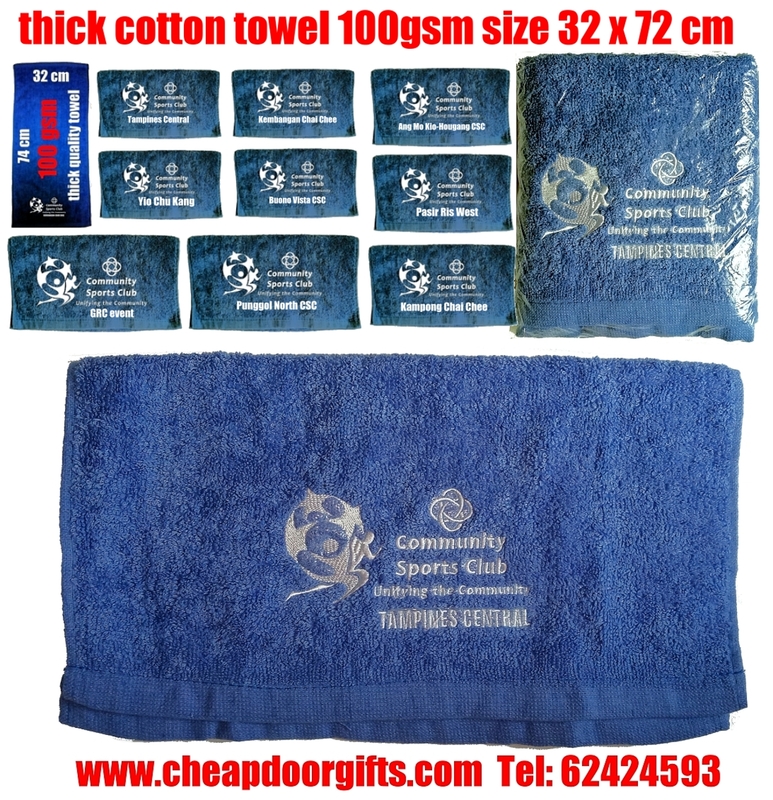 long towel size 32 x 72 cm. 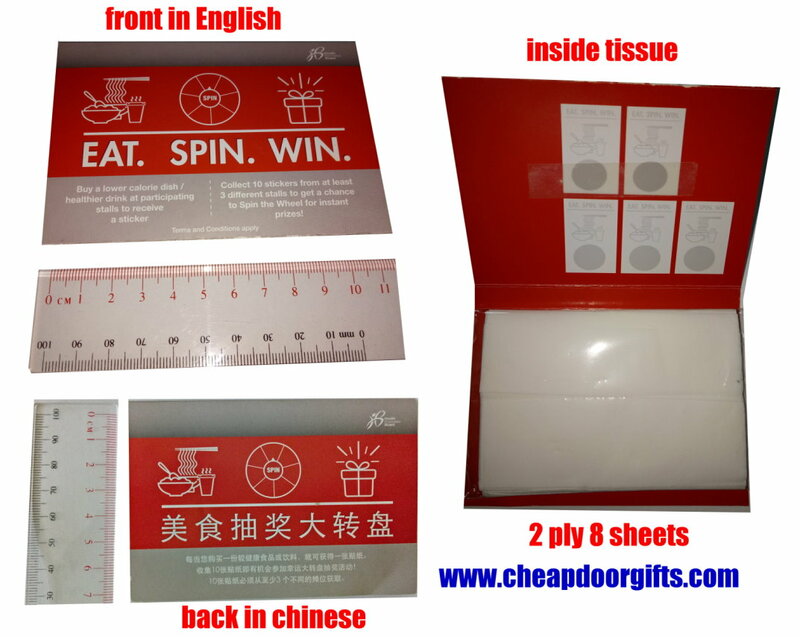 $2 with free 1 color silkscreen (print in our china factory) & transaparent packaging moq 1000 for limited period hurry !!! contact us for small qty price. additional cost for embroidery. 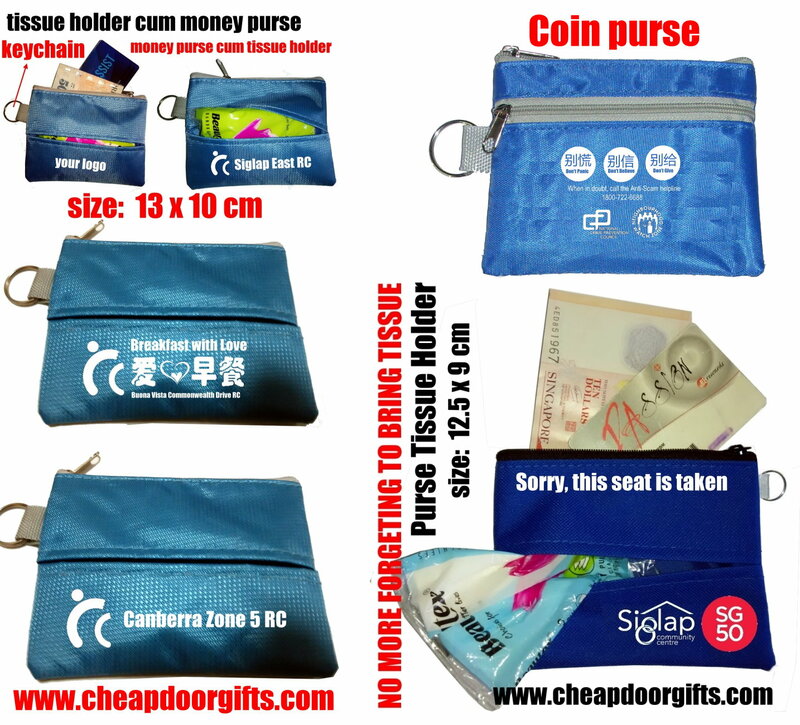 our best selling pouch, everyone love it. 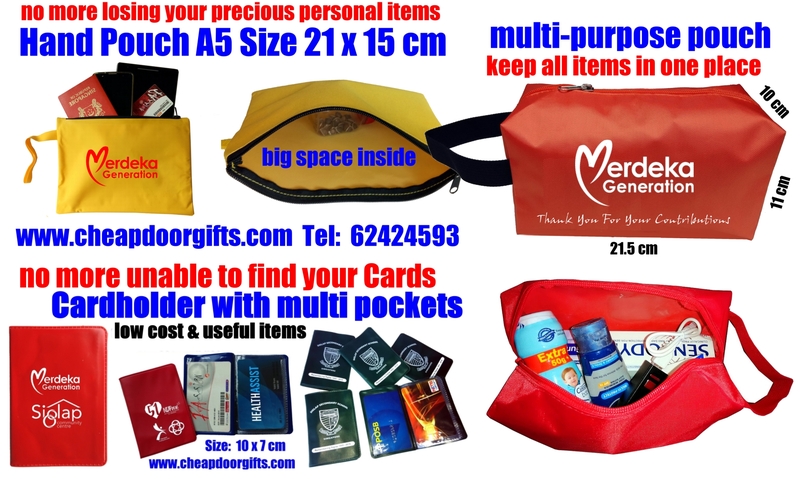 For travel, toiletries, gadget or accessories storage, sports and more. $2 include FREE 1c print for moq 500. Contact us for small qty price. 2019 favourite gifts !!! Say NO to disposable paper cup or plastic water bottle. The Collapsible Cup BPA FREE great for outdoor or travel. The pop-it design lets the cup collapse down for compact storage (2cm thickness only) in your bag or pocket. no more losing your valuables or personal items. 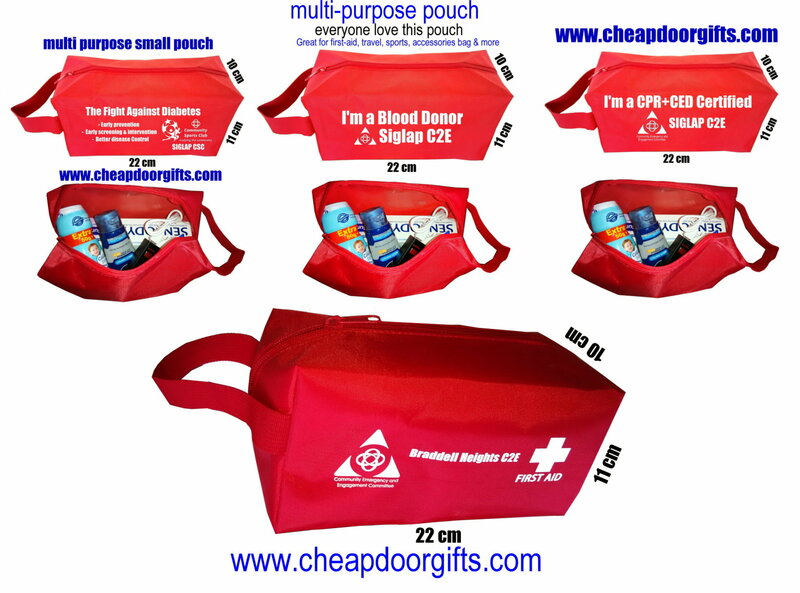 Great for travel or keep all items in one place whenever you need it. Can be customised to your sizes and logo printing. a paper holder to keep papers upright while you type from them, view them, or to remind you important messages and more. Save the hassle of looking for a suitable coin while renting a trolley from the supermarket. 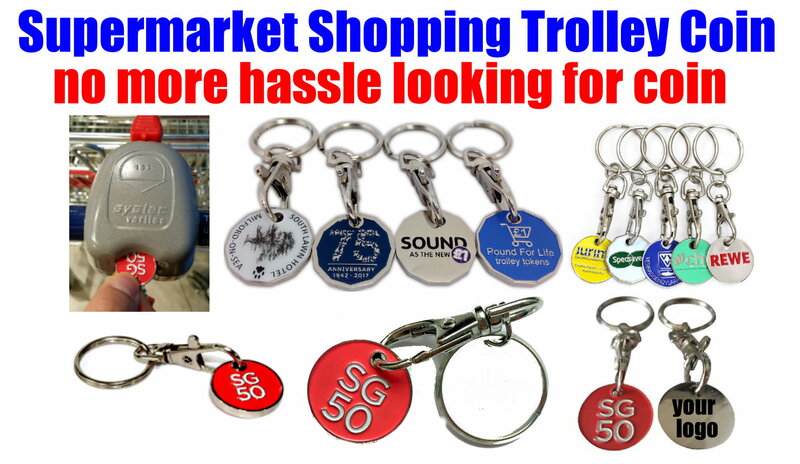 Just pop in the Supermarket Trolley Coin, it works just like a regular coin. MOQ 1000 and above. small and easy to carry around. Size: 23 x 19 x 9cm. 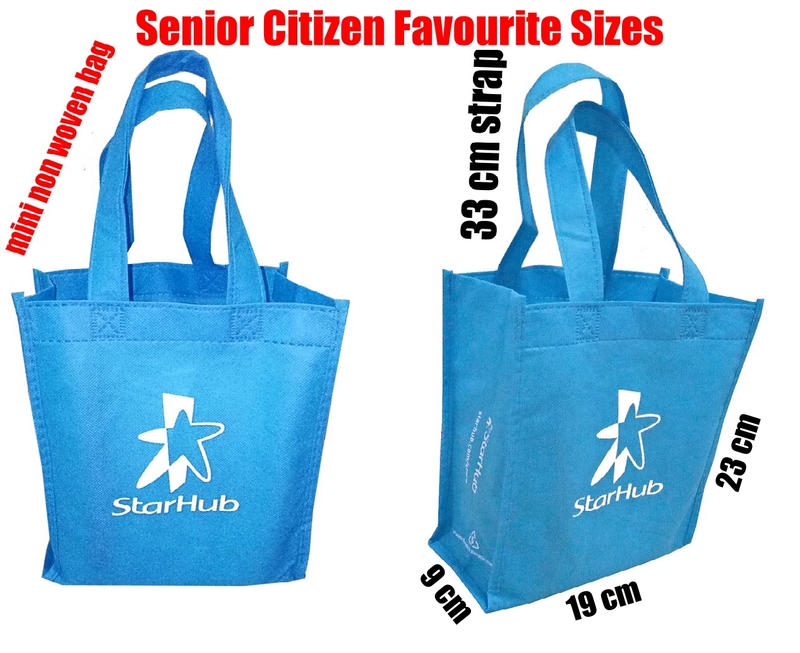 very popular with senior citizen who love this small bag. trademarks belonged to the respective owner & for illustration only. NO MORE forgeting your tissue, coins and keys !!! 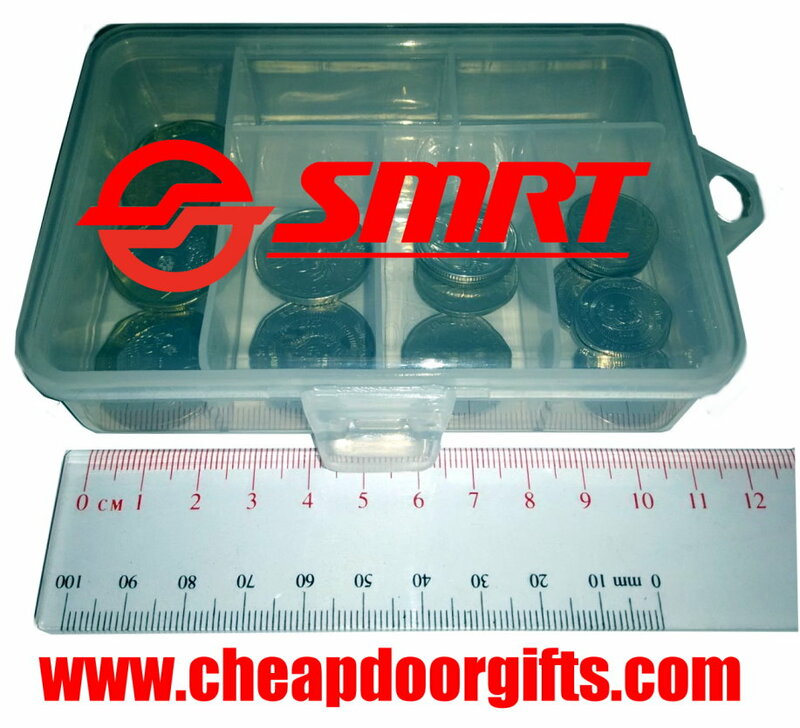 low cost and very useful doorgifts. Very useful gifts with keychain. With keychains ring. Not more forgeting your keys, cards, coins and etc. Can keep stacks of dollars note that normal wallet cannot. 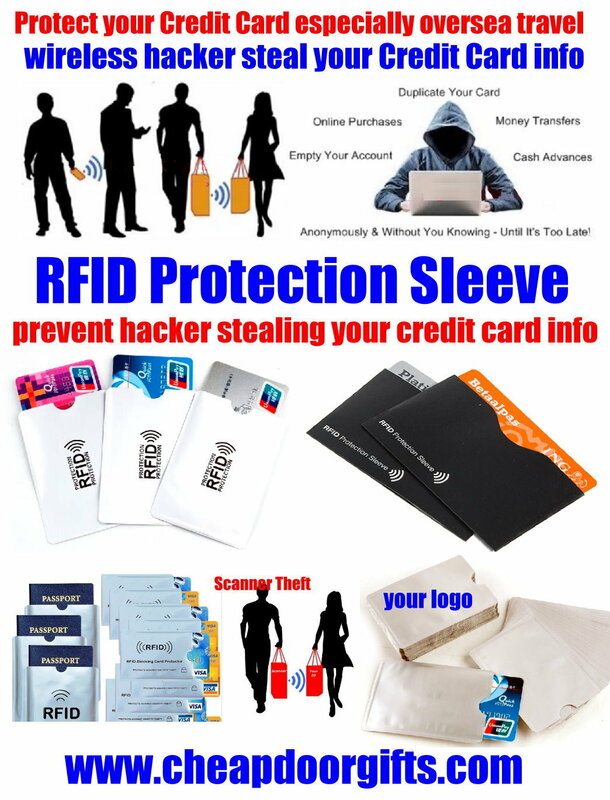 Wireless Hacker can steal and use your Credit Card info for purchase without your knowledge especially overseas travel. A great gift many appreciated !!! can also used as card holder. Don't leave home without it. 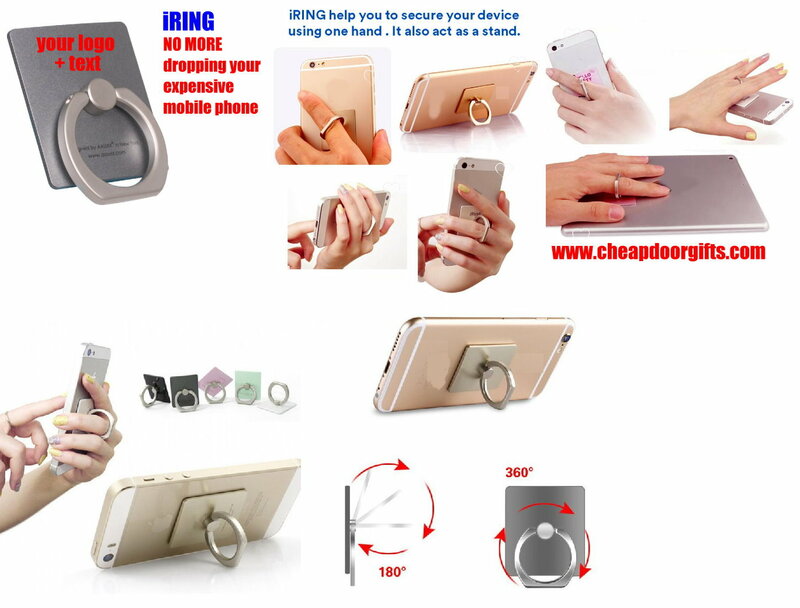 we can customise to any sizes handphone. 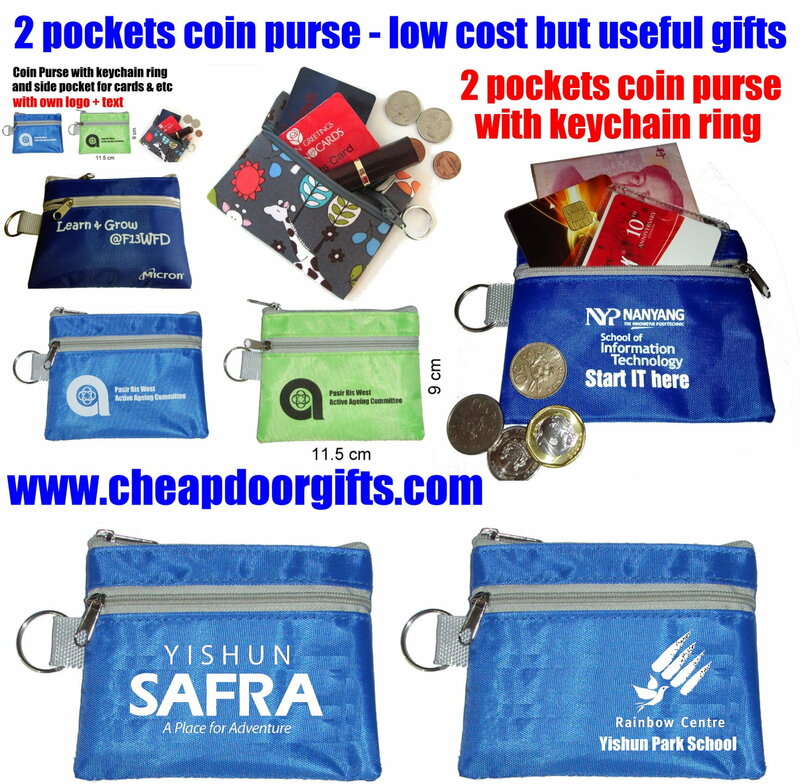 A great marketing gifts to enhance your company or events. print your logo !!! 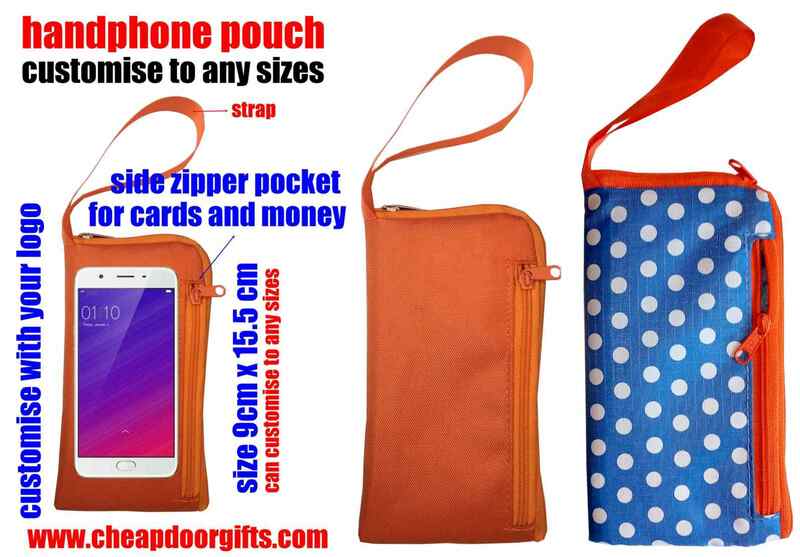 Side zipper pocket great for cards, money and etc. 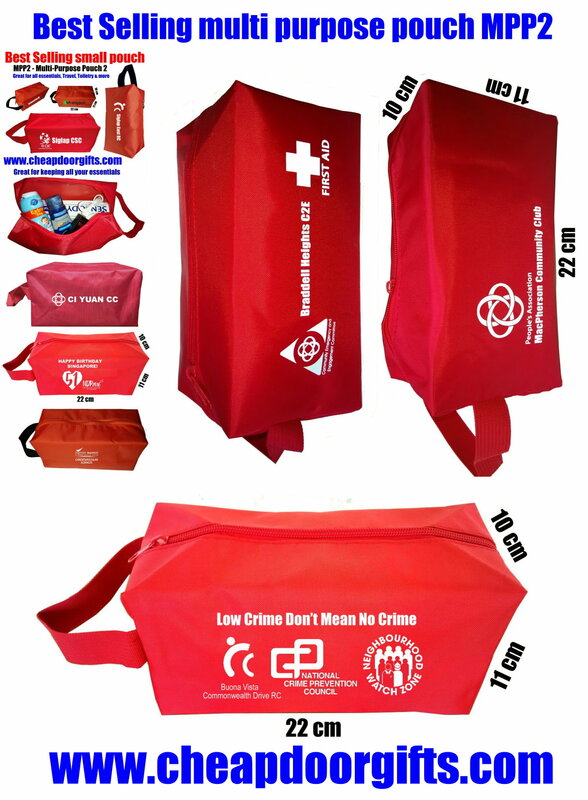 Low cost and effective marketing campaign to create and promote awareness of your company or products. to make you relax and hands-exercise. Great for senior citizens. low budget to promote your events and etc - Can be customised to your requirements. Say THANK YOU to their contributions to Singapore. now can easily find the coin you wanted. small size 11 cm x 8 cm easy to carry about. FREE your hands. now you can bring along money, hp, car keys & etc when doing sports. 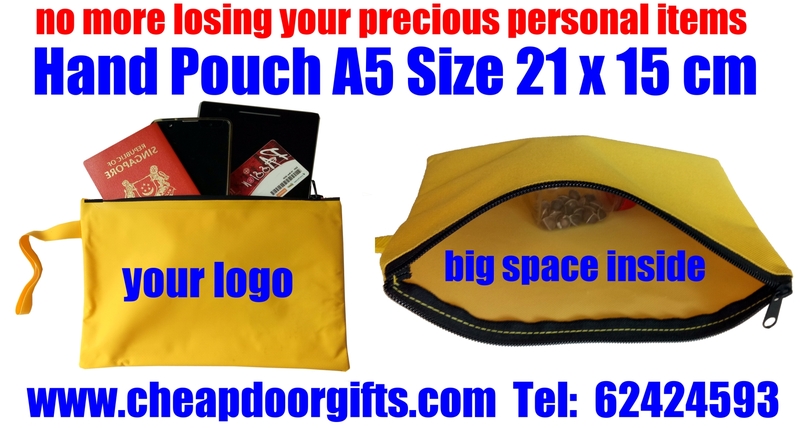 Great for keeping important receipts, money, travel, Pencil Case and etc. 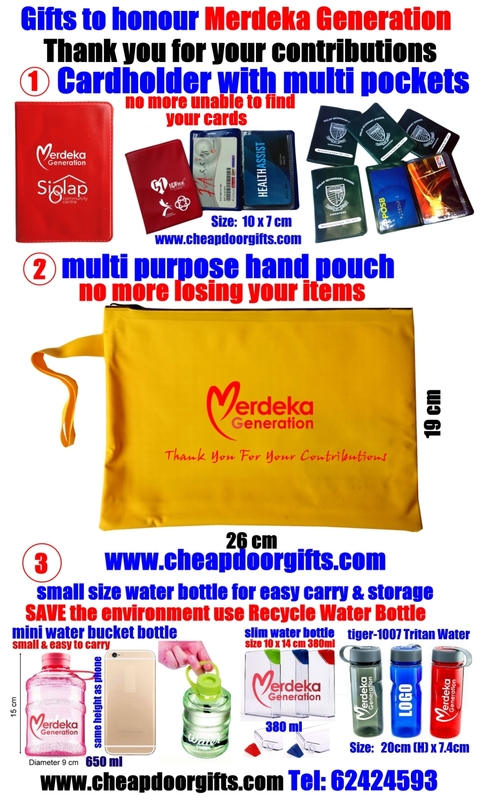 low budget but high impact doorgifts to keep all important receipts, money and etc in one place !!! customised with your logo and text. Small and very light when folded. Easy storage when not in use and easy to carry about. Protection against Sun and Rain. 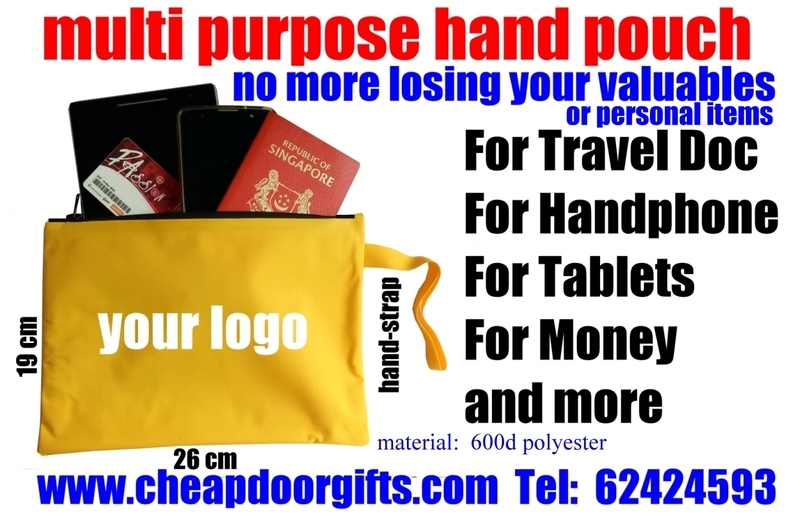 NOT using it just FOLD it ( 14cm very small ) - Easy to store and carry . a MUST HAVE item when outdoor or holiday travel. we provide all sizes and customised based on your requirements. A truly inexpensive eyecatcher, badge buttons are an ideal way to create awareness of promotions or as a remembrance of events. we apologise unable to list all our items - over 1000 items. Please email us your requirements and budgets. Thank You.